There were 8 valid summaries submitted to the jury. And the jury chose the summary submitted by @rasamuel. Tortured, head bent and covered in blood, William Chang looked up and saw the faces of two of his most trusted soldiers. “We’re to help you, sir. We managed to escape.” General Chang was weak, dejected. “We can still take back control of the ship, sir! We must fight!” And in a second a mini-war began on William Chang’s ship, between the General’s men and Van Hal’s men. After hours and hours of fight, and launches of blasters and explosives, the ship’s engine gave up, sending them crashing from space, directly into no other place but Raoulin V-- Raoulin V, where a most astonishing revelation awaits them! The citizens of Raoulin V were against the war. Not only are only a handful of their selfish leaders the ones behind it, they are being backed also by Top Federation Officers who tend to benefit from war; they had planned to wipe them all out to cover their tracks. But now Chang had another decision to make--run off and take his crew into safety, or stand and fight against tyranny! SteemShort are short stories written collaboratively by three differents authors and illustrated by an artist/photographer. The process to create a SteemShort is described in this post, slightly modified bin this post. The rules to select the authors and illustrators have been modified in this post. The first two parts has been written by @gbengaremi (Gbenga Remi) and @jacksondavies (Jackson Davies). They can be found below. This is the request for the last part of the sixth SteemShort. Authors that want to write this last part should send 0.001 STEEM or SBD to the @steemshorts account, with their proposed summary in a memo starting with the character '#'. It is important that the memo starts with the character '#': that makes this memo readable only by the author and the @steemshorts account. There can be only one proposed summary per author. The proposed summaries must be received in less than 3 days after thist post. After sending their summary, authors should tell in a comment that they have sent their summary, so that they can received confirmation that their summary is valid and they can be easily contacted if they are the chosen author. After 3 days, all the valid summaries will be communicated anonymously to the 3 members of the SteemShorts jury, and they will decide which author will be chosen. The chosen author will then be instructed how to submit their full constribution. The full contribution need to be between 500 and 1,500 words. Once the full contribution of the chosen author will be received, another post with this full contribution will request proposals for an illustration for the story. All authors need to agree for a "Creative Commons Attribution-Share Alike" (https://creativecommons.org/licenses/by-sa/4.0/legalcode). No title for the short story should be suggested. When the full text of the full story will be known, the three different authors will propose a title. Rewards for each part of the story are half of total SBD payout, minus the jury fee of 15 SBD. 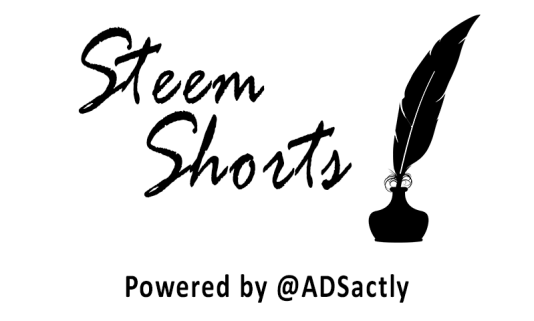 So, writers, send your summary proposals with 0.001 STEEM or SBD to the @steemshorts account. I have sent a proposed summary to the steemshorts account. Thank you for your valid summary. I already sent my summary for the third part of #6 Steemshort. Thank you very much. Congratulations, you are the chosen author. Please contact me on steemit.chat (vcelier) for your full contribution. Thank you @vcelier, I will do that now. Hello @vcelier. I submitted a summary yesterday but forgot to make this comment. Hope I'm not too late for consideration. The list is updated on a daily basis and your contest will remain on the list until its expiration - there's nothing you need to do. Tour so-called "proposal" has nothing to do with this Steemshort. @adsactly this is an awesome undertaking you have running here, I should admit that you motivate and empower many individuals here, this venture is excellent and deserving of proposal. If it's not too much trouble keep it, God favor you. Hello @adsactly, I just submitted a summarised proposal for the middle part of the Steem Short #7. Thanks. we are looking for summaries for the last part of Steemshort #6, not for the middle part of Steemshort #7. We cannot find your proposal. @adsactly, the story is nice, but may i know, after getting an perfect "last part" what will you do with that summary? Waoo, good history, greeting @adsactly. This is a great initiative and a big possibility to colaborate and create art together. I really love the idea, must be a cool feeling to participate in something new like this. The things we have not yet experienced are the one that helps us grow much faster. Good luck to third lucky person. I bet you will have a great time speaking your mind and creating something beautiful. I see this contest is not something you can take with ease and I hope this will bring out the best of you. @adsactly this is a wonderful project you have got running here, i must confess that you inspire and encourage a lot of people here, this project is laudable and worthy of recommendation. Please keep it, God bless you. Thanks sir @adsactly for another article share. 1st time i comment your post then i star reading your article. an amazing effort with helpful info,great thinking.Appreciated! Where did you submit it? Where did you submit your summary?